From ravioli to ramen, house-made noodles are comfort food at its finest. Here’s where to start slurping around town. Ready your forks—and your chopsticks. Noodle joints around town dish up delicate pastas, steaming ramen bowls, and just about everything in between. 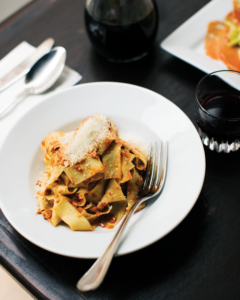 When it comes to pasta, Mike Easton knows his stuff. The chef-owner of Il Corvo (217 James St; ilcorvopasta.com) built a loyal following at his lunch-only Pioneer Square restaurant based on a menu of daily-changing pastas, all made in-house, by hand, using old-school bronze dies. If you’re craving pasta for dinner, head to Vendemmia (1126 34th Ave; vendemmiaseattle.com), chef Brian Clevenger’s simple Madrona restaurant, where the freshly made pastas (particularly the seasonal ravioli) are revelatory. Clevenger’s newly opened Raccolto (4147 California Ave SW; raccoltoseattle.com) in West Seattle is even more heavily focused on pasta, with nearly 20 varieties daily. For more house-made pasta, try Tom Douglas’s Trattoria Cuoco (*310 Terry Ave N; cuoco-seattle.com), where a pasta-making workstation is set up inside the front door. For ramen, one consistent favorite is a Japanese import: Kizuki Ramen & Izakaya (multiple locations; kizuki.com). Slurp the delightfully chewy noodles, particularly delicious in the rich tonkotsu or citrusy yuzu broths. 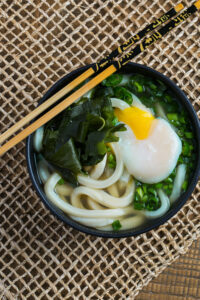 Another Japanese favorite are thick cylindrical noodles known as udon. 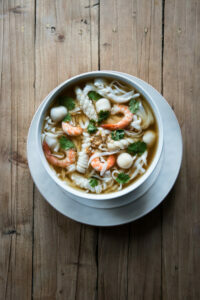 Stop by the aptly named U:Don (multiple locations; freshudon.com), where the house-made noodles are the highlight of the casual, customizable menu. Nosh on Chinese-style, hand-pulled biang biang (wide, thin rice noodles) at Xi’an Noodles (5259 University Way NE; facebook.com/xiannoodles), a bustling, modest University District restaurant. 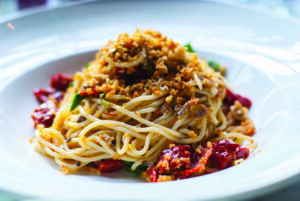 Don’t miss the classic version, which features the noodles tossed with chili oil.